This month there's 9 pages of my comics in the current issue of Mania, #75, August 2007 - the regulars, Moth & Tanuki, in a 4 pager, plus another 5 page comic! More on that in the next post. If you like my comics and haven't bought Mania before, this one's a good place to start! This episode of "Moth & Tanuki" kicks off with a familiar setting - Mothy's father's Invention Room - though evidently some time has passed between this and the last time it appeared (actually in OzTaku #1.2, which has also recently come out). Yep, here comes that kid again - some people never learn! I'm trying to work him in every third or fourth episode as he brings something different to the strip. He's in the one I'm currently working on, which is different to anything I've ever drawn before and he even gets a name! Here's a quick throwaway panel from this same story, which I'll elaborate on in another post. I imagine a lot of people (in Australia) fondly remember cereal toys. For various reasons, dragons have been on my mind over the past week or two. This is a design I did for a business card for Wild Iron, a metalcraft business, a while ago, and it seemed appropriate for this week's Illustration Friday theme of "Twist." (I did have an idea for "Camouflage" as well, but no time last week). This particular version was created from a bad photocopy specially for IF :). The original brief was to work a Celtic knot into the card design, which was tricky as they don't really have a beginning and end as such, being usually a number of strands threaded together. I played around until I got the knot I wanted for the tail and worked it in with the rest of the design. I think these were printed in silver. As I've mentioned before, I'd had a lot of years of not drawing when, one day, our neighbour Karol (who ran Wild Iron) complained to Jill about the problems she was having getting a graphic designer to draw a leaping cat for her (to be cut out for a shop sign). Jill suggested she come over later and get me to draw it for her, which I did. 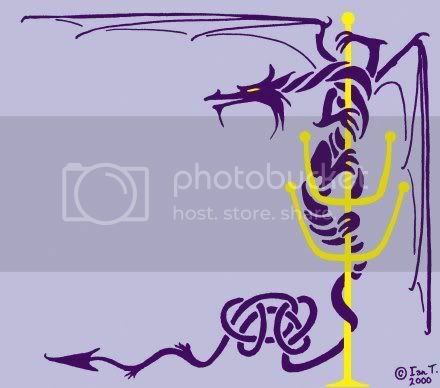 From there, Karol and I did a bit of work together - mostly metal cutouts such as the dragon mirror pictured here (which sold well and I have this one hanging on the wall), fairies, witches, painted dishes, etc. This was what started me drawing again, something I hadn't thought of doing in a long time. This one could probably pass for "Twist" as well :). 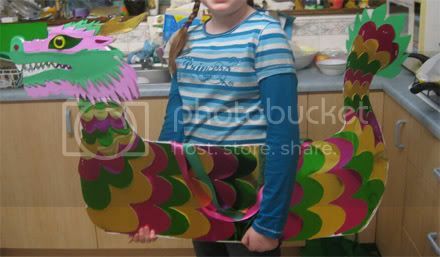 Here's what's been keeping L and I busy over the past few weeks - it's a Chinese Dragon Boat for her School project, made using cardboard, craft foam and some heavy cardboard for the base. It worked out well, as it was light enough to race in effectively. The main problem children had with their various dragon designs was keeping them looking like Chinese (rather than Western) dragons, particularly Viking boats. Did I mention how good the "Dragonology" boardgame is? Maybe I'll write that up in another post, when I get the boot into the (separate) Earthsea TV miniseries and film (so many ways to go wrong with that one, apparently).